Blue globe icon with green continents and soft shadow on light blue background. On November 12, 2015, Portland Mayor Charlie Hales took a step no other U.S. mayor in the U.S. -- and perhaps the world -- has yet taken: He submitted a resolution, supported unanimously by Portland's city council, calling for an end to all new fossil fuel infrastructure within the limits of Oregon's largest city. This resolution is the most far-reaching of its kind in the country. Portland's City Council has gone on record claiming it will "oppose expansion of infrastructure whose primary purpose is transporting or storing fossil fuels in or through Portland or adjacent waterways." The local authorities are now going to codify the language into law, and work to ensure a "just transition" for any workers that might be economically dislocated as the city moves toward a greener and more sustainable economy. While a few press outlets reported on the news, others shrugged as if to say, 'This was simply Portland being Portland' and it couldn't happen anywhere else. But to those who think this is a one-off event, think again: Portlanders' and Hales' journey to this point is truly breathtaking and has the potential to reverberate nationally, and even internationally, as a tale of resistance, redemption, and triumph. The story around Portland's resistance to fossil fuel exports began in recent years when local activists realized that Portland, like other cities in the Pacific Northwest, was under assault, with proposals to build oil, gas and coal terminals whose cumulative carbon impact was apocalyptic. Some studies suggested these projects, if built, would carry as much carbon annually as five Keystone XL pipelines. The first kayak protests in Portland began as part of a joint action around the world--to signify the optimal atmospheric concentration of CO2 in the Earth's atmosphere, 350 parts per million. (The world has now surpassed 400 parts per million CO2.) In July 2013, as part of the "Summer Heat" actions undertaken globally, Portlanders hung the now infamous banner which stated simply, "Coal, oil gas: None shall pass." The bridge targeted for this banner hanging, the I-5 Bridge, was chosen for its symbolic value: It linked Portland, OR, and Vancouver, WA, where Tesoro-Savage Oil Company was hoping to build the nation's largest 360,000 barrel per day oil-by-rail terminal, with much of that "oil"--or bitumen-- coming from Canada's tar sands. The bridge also spanned the Columbia River, a potential choke point for many of the coal barges and other fossil fuel projects that would have to make their way down the breathtakingly beautiful Columbia Gorge. So when Hales announced in 2014 that he would welcome a $500 million proposal by Pembina Pipeline Corporation, the largest pipeline company in the Canadian tar sands, to build a propane export terminal in Portland, environmentalists and neighborhood organizations got to work collaborating on strategies to defeat the proposal. They hounded Hales to oppose the Pembina project. They photo-bombed his press conferences. They temporarily took over city council meetings on Earth Day. They went so far as to follow him with a caricature of himself, a poster of "Fossil Fuel Charlie," posted all over town. Then, just as suddenly as Hales had announced his support for the terminal, he did an about-face. In response to thousands of emails, phone calls and letters, and an outpouring of testimony at public hearings, he withdrew the Pembina propane terminal from consideration by the City Council. Though this move was popular with the many Portland communities and neighborhoods that stood in opposition, the recriminations started coming in from the business establishment, building trades, and the anti-environmental editorial pages of Oregon's largest newspaper, The Oregonian. They scolded him for throwing away the single largest business investment in Portland history. Hales' mayoral opponents began to line up to take him down in the next election. Then the Pope called. Pope Francis invited Hales to join him at the Vatican in late July, together with 60 other mayors from around the world. It was then, when Hales recalled hearing the Pope talk about the "world leaders" in the room that something clearly shifted for him. Hales said he kept looking over his shoulder, trying to figure out which one was the world leader he had yet to meet. Then, it seemed, Hales got it: Pope Francis, in keeping with the Catholic teachings of subsidiarity, was brilliantly urging the mayors, which some see as the least powerful elected officials on the world stage, to take the mantle of world leadership on the climate crisis. 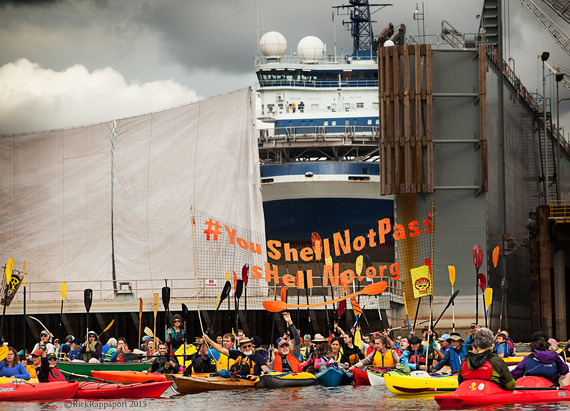 Hales flew home from Rome, to find his city suddenly in the global spotlight: "Kayaktivists" and Greenpeace climbers were blockading Shell's icebreaker, the Fennica, in Portland's ports. For 40 hours or more in record-breaking heat, activists prevented the Fennica from departing for the Arctic, where the ship was to assist Shell as it attempted to drill for oil in the rapidly melting Arctic. Then the President called. President Obama invited Hales to the White House for a ceremony announcing his Clean Power Plan. Prior to meeting with the president, Hales turned for advice to one of the instigators of the banner-hangings against coal, oil and gas: A young 22-year-old activist named Mia Reback, an organizer with 350PDX. Mia gave the Mayor a heart-to-heart talk: Tell the President to withdraw the leases for drilling in the Arctic, she told Hales, and that we have run out of time and can't afford to treat gas and propane as "bridge fuels." We need to transition to renewable energy now. What happened next is nothing short of miraculous: Within weeks, Shell withdrew from the Arctic and President Obama cancelled existing leases for offshore oil and gas drilling in the Arctic. Shortly thereafter, Hales announced he wouldn't seek reelection. Instead he would use his remaining time in office to make an aggressive push on issues that mattered most to him. First up: climate change. He called on his staff to rapidly put in place a "fossil fuel policy," a key component of Portland's climate action plan. That policy, with broad support from several indigenous tribes, together with faith leaders, children, and elders, was passed as a resolution on Nov. 12. In a vote of 5-0, the City Council unanimously voted to put in place a groundbreaking policy that essentially means Portland will no longer build any fossil fuel infrastructure in the city or its adjacent waterways. But neither activists nor Mayor Hales are resting on their laurels. Both realize that Portland's actions alone are not nearly as meaningful in tackling the climate crisis unless other cities join them. And so once again, tirelessly, we are pushing further. On December 11-12, 2015, Mayor Hales has invited the mayors of all of the major West Coast cities to Portland for a meeting on the two intertwined issues he discussed with the Pope in Rome: climate change and human trafficking and homelessness. This time, we will be working in support of our mayor, not against him, in calling on all of the west coast cities--and not just the large cities invited to the meeting--to institute a similar resolution for no new fossil fuel infrastructure. Unlike the climate negotiations in Paris, where "world leaders" will be hidden behind barricades, secure from another terrorist attack, and where, if the past is any guide, they will be negotiating around who can do the least to act on this planetary crisis, our hope is the mayors' meeting in Portland will be refreshingly different: Here, mayors will be able to engage each other in a virtuous competition, learning from one another's innovations, pushing each other to go farther. Will some follow Portlanders' lead, and agree to put an end to new fossil fuel infrastructure in their city's limits, too? It's hard to say, just yet. But if this happens, we might actually look back on Portland, those activists, that banner proclaiming Portland off limits to the fossil fuel industry, and those kayaktivists, along with their mayor, as the people who finally took their place as the world leaders they are. Join us.